> Research Library > AT&T > Are you ready for a DDoS attack? Distributed Denial of Service (DDoS) attacks are among one of the most disruptive and vicious activities passing over the Internet. DDoS attacks can overwhelm web servers and saturate a company’s connections to the Internet resulting in the inability to maintain efficient communications and connectivity and can ultimately impact business operations. By integrating the predictive and early warning capabilities of AT&T DDoS Defense, AT&T is delivering one of the most potent tools against denial of service attacks, which have crippled entire networks and brought businesses to a halt. Are you prepared if and when it happens to you? 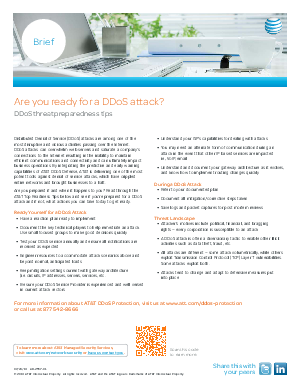 Read through the AT&T Top Readiness Tips below and see if you’re prepared for a DDoS attack and if not, what actions you can take today to get ready.